Jewelry is a great way to commemorate your great accomplishments! 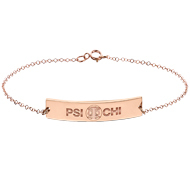 We have partnered with Herff Jones, one of the leading graduation/greek jewelers in the US, to bring you quality Psi Chi Curved Bar Bracelets. All manufacturing, payments and shipping will be handled by Herff Jones. Once you select an item below for purchase you will be redirected to their site. Because these are custom crafted products shipping can take 4-6 weeks from order date. Mastercard, Visa, Discover, and American Express payments accepted. Any order cancellations 72 hours (3 days) after purchase are subject to a 25 percent cancellation fee. If you have returns they must be made within 30 days of shipping using the address below. 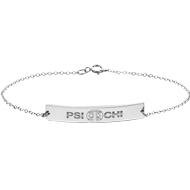 Psi Chi Merchandise is not involved with payment or shipping of the Psi Chi Curved Bar Bracelets. For further questions please use the Herff Jones Contact Form below.